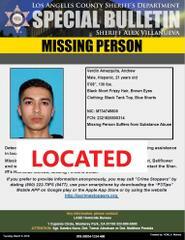 Los Angeles County Sheriff’s Department Missing Persons unit detectives have located Andrew Verdin Amezquita. Thanks to everyone who provided tips. 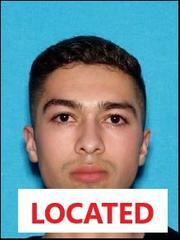 Los Angeles County Sheriff’s Department Missing Persons Unit detectives are asking for your help in locating Andrew Verdin Amezquita. He lives on the 9500 block of Oak Street in Bellflower and has not been seen or heard from September 2018. Andrew is a male Hispanic 21 years-old, 5’8” tall, approximately 130lb, black hair, brown eyes and suffers from substance abuse.